Moments ago we noticed that the first DROID 4 update had been approved as build 6.13.219 and would be arriving in the near future. And then moments after that, we received the update file from a friend and have it for you below. It weighs it at around 18MB and can be applied over the top of 6.13.215 (the current build). 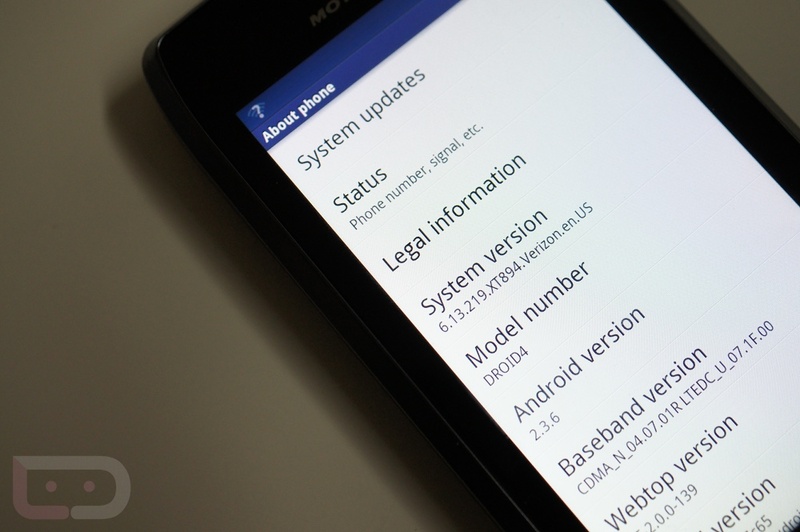 You will notice that build number in the title of the file, but that’s how Motorola does it – they always name their update files with the the build you are coming from, not the one you are going to. *We have been told that Voodoo Rootkeeper will keep root and that other root methods work as well after updating. 1. Download the file to the root of your SD card. 3. Press both Volume keys and Power at the same time to get to the bootloader menu. 4. Scroll down to “Recovery” and press Volume Up to select it. 5. When the Android and exclamation mark appear, press both Volumes at the same time. 6. Scroll down to “apply update from sdcard” and select it with Power. 7. Scroll down to “Blur_Version.6.13.215.XT894.Verizon.en.US.zip” and select it. 8. Watch the update install. Reboot when it finishes and enjoy!